My favorite liquid anti-viral product remains Jon Barron's Super ViraGon - a potent combination of garlic, olive leaf extract (a powerful anti-viral! ), onion, ginger, zinc and other nutrients. I keep this in my own emergency supply of natural medicine. It's available from www.BaselineNutritionals.com for a very fair price (order five for the best discount). The PowerImmune anti-viral tincture offered by Fitura (www.Fitura.com) combines organic Echinacea, Cat's Claw, Shiitake Mushroom, Olive Leaf and many other ingredients (all organic). This is another "medicine chest" product I keep in good supply. It's also good to travel with. I personally take a dropper full of this product each time I board an airplane. Living in Ecuador, this is also a "first aid" product I keep with me in the Valley of Longevity. Of course, if a pandemic were to strike, I would just go to my garden and eat all the natural anti-virals located there, but if I'm caught traveling -- or I need an extra boost of herbal concentrates, PowerImmune is one of my top choices. This product is the "secret" anti-influenza herb that very few people know about, even in the natural health industry. The root of the Lomatium is perhaps Mother Nature's "perfect" anti-influenza herb because its anti-viral action is combined with a respiratory clearing action that's especially useful for dealing with the secondary infections caused by many strains of influenza. Nature's Answer has a 1-ounce tincture that's available at Vitacost.com for a ridiculously good price (http://www.vitacost.com/Natures-Ans...). This product will probably be wiped out of inventory shortly after this special report goes public, so get some of this quickly if you want it in your natural medicine chest. Speaking of Lomatium, HerbPharm offers an herbal tincture that combines it with St. John's Wort (also a powerful anti-viral), lemon balm, olive leaf and other powerful anti-viral herbs. This is a superb combination. It's really, really powerful in defending against influenza infections. Vitacost offers it at nearly half off the retail price (http://www.vitacost.com/Herb-Pharm-...). I definitely recommend getting some of this. You might also wish to check your local health food stores to see what they have in stock. During a pandemic, I can practically guarantee you won't be able to find any of these medicines, because people will engage in "panic buying" of these natural anti-virals. It's smart to have a few on hand now, before the next pandemic strikes. One taste of real olive life extract and you'll be convinced: This is powerful stuff! The best-known phytochemical in olive leaves is oleuropein, a very potent antimicrobial medicine that also has natural anti-viral properties. Your best value on a standardized extract, in supplement form, is the NSI brand from VitaCost (http://www.vitacost.com/NSI-Olive-L...). I personally like the liquids better (http://www.vitacost.com/Natures-Ans...), but the taste is a big turn off for most consumers. If you're not into chugging really bizarre-tasting liquids, go with the capsules instead. Ideally, your best way to have this medicine nearby is to grow your own olive trees. To make the medicine, just gather leaves from the trees, wash them, add them to a large container of water and boil it into a concentrate. This liquid can be consumed internally or used topically. Seek the direction of a naturopathic physician, of course, before consuming this internally, and be especially cautious if you are pregnant. The shelf life of most of these natural medicine products is about 1-2 years. That can be roughly doubled by refrigerating the products (highly recommended). • Audio program: How to Prepare For and Survive Any Pandemic featuring Dr. Sheldon Marks and the Health Ranger. Covers emergency medical preparedness and more. • The Swine Flu Advanced Preparedness Course with the Health Ranger, including Q&A from readers. 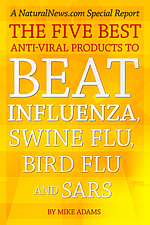 Includes powerful strategies for protecting you and your family from any pandemic.